Above: Felipe Ortega micaceous pot. Photo by Douglas Merriam. 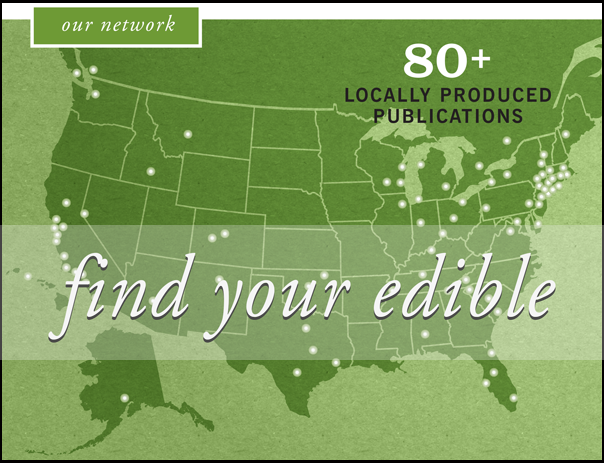 This story comes to us from Edible New Mexico…. It’s just after 6pm but it feels like midnight in La Madera. It’s completely dark outside, except for the stars and a few strings of holiday lights. It’s dim inside Johnny Ortiz’s farmhouse. A selection of bowls and cooking pots are laid out. At first glance, they appear as dark as the winter night. I pick up one bowl, shockingly thin and lightweight for a ceramic piece, and turn it toward the glow of the fire. I’ve been told even tap water tastes better in one of these. A glittery surface shines in the light. Tiny flecks of what appears to be gold and silver are scattered throughout the matte black exterior. The glitter comes from local mica and the ashen surface from smoke. The optical effect is magical; just a hint of the extraordinary story these pots hold. 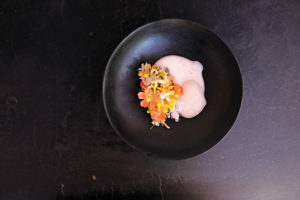 Ortiz is the creator and chef of Shed, an ongoing dinner series based in La Madera that celebrates foraged and farmed ingredients native to northern New Mexico. Wild plums, honey mesquite, and heirloom white corn aren’t the only hand-crafted elements of the meal. “When I started Shed, I wanted to make my own ceramics,” Ortiz says. Initially, this meant porcelain ware, which he learned to make while living in California. 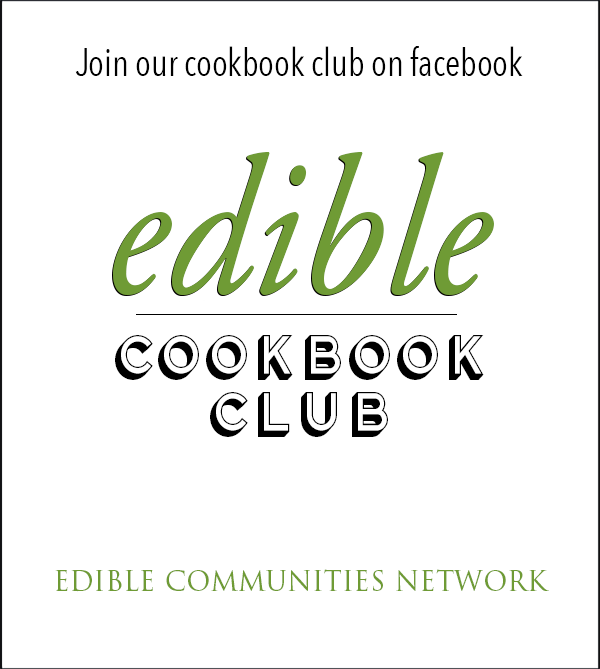 When the dinners found a home in New Mexico, he wanted something that resonated with the place. “I’m from Taos Pueblo and we have a tradition of micaceous, pit-fired pottery,” he explains, “so it felt right.” Not only would it be economical for Ortiz to create his own plates and bowls from local materials, but it would also be an opportunity for him to honor a personally significant cultural practice. Micaceous clay runs through all aspects of Ortiz’s life and work. His cooking pots are micaceous, as are all of his serving dishes. He soaks film in a watery solution of the clay and uses it to photograph his cooking, his animals, and the natural world around him. Gauzy, pinkish window curtains in the hallway get their color from a micaceous dye. His brother, Brandon, also works in micaceous. Even the most unlikely elements of the micaceous practice find purpose in Ortiz’s world. He prepares us a cocktail: mezcal, tonic, and a native three-leaf sumac berry. Instead of ice cubes, frozen rocks of rose quartz stones he sifted out of the clay chill the drink. We later taste the mezcal, Del Maguey Chichicapa, on its own, in a small micaceous sipping cup. It tastes exceptionally floral. I can’t tell if it’s the quality of the mezcal or the clay itself. “It does change flavor pretty considerably,” Ortiz says, claiming food has more depth and is more dynamic when served in the mica-rich pottery. More specifically, he adds that “acidic things become sweeter,” which could account for how quaffable the cocktail is. “It’s not vitrified and it’s not glazed, so all of the flavors are literally traveling throughout the clay,” explains Yolanda Rawlings, who has been working in micaceous for more than ten years and currently teaches it at Santa Fe Community College. Rawlings studied closely with Felipe Ortega, who is widely considered a master of the micaceous tradition. You can’t talk about the legacy of micaceous in New Mexico without mentioning Ortega, a Jicarilla Apache potter, who is widely credited for reviving and popularizing the tradition. When he was a kid, he told his mother he didn’t like the taste of beans. She insisted he would like them if he ate them from his grandmother’s pot. Unfortunately, this pot was the only one of its kind, and the last remaining village resident who knew how to make these valuable vessels was ninety years old and blind. Ortega went to her immediately, determined to learn the craft. His first five pots broke in the fire, but the sixth one survived. This small success defined the trajectory of his life. Ortega devoted himself to the micaceous tradition and shared that knowledge with locals and the world. He became a micaceous missionary. “He shipped five hundred pounds of clay to Switzerland for a workshop,” says Katherine Kagel, the owner of Pasqual’s and an early, enthusiastic champion of Ortega’s work. She still recalls the taste of her first meal cooked in micaceous. It was local lamb, stewed in one of Ortega’s own pots, and the experience was life-changing. Her kitchen is now fully stocked in micaceous, as is her gallery. Above: Micaceous plate created and photographed by Johnny Ortiz. Evidence of micaceous clay pottery dates back to at least AD 1300 in New Mexico. Mica-rich deposits are commonly found in volcanic, high-elevation regions such as the northern Rio Grande area. The tradition is most closely associated with the Taos and Picuris pueblos, but it was also used by the Jicarilla Apaches and other Native communities. Though in recent decades it has gained recognition as an art object, and contemporary Native artists are now working in micaceous, it is still predominantly considered a utilitarian craft. Technically, all micaceous pots are cooking pots, so you could use that ten thousand dollar gallery piece for making beans. Clay cooking is an ancient custom worldwide, but mica-rich earth is uniquely well-suited to the task. Mica is extremely durable, conducts heat very evenly, and holds heat long after it’s been removed from the flame. It acts more like a little clay oven than a sauce pot. You can cook beans or adovada over an open flame and then serve them at the table from the same, still-warm pot. 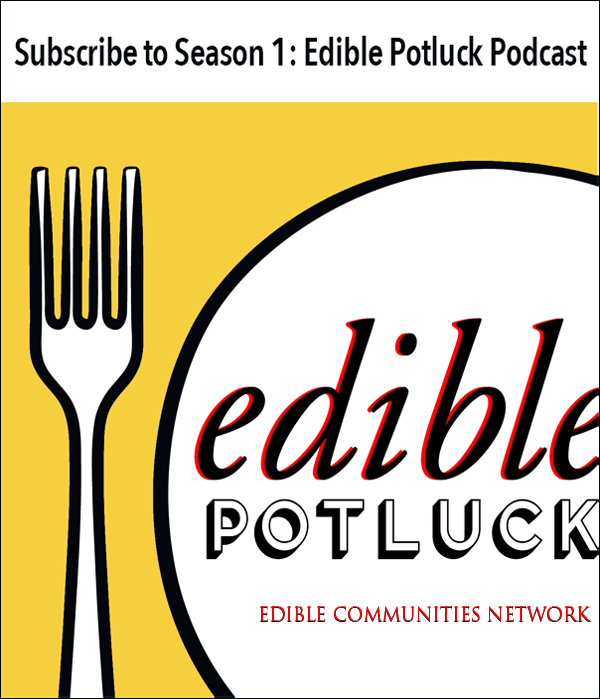 For many home cooks in New Mexico, micaceous pots are synonymous with beloved, regional dishes. 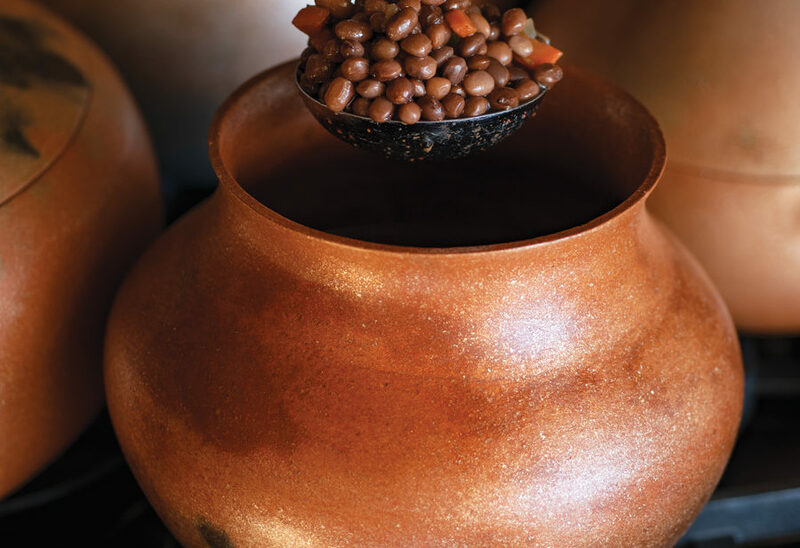 “Green chile stew, pinto beans,” says Rawlings, “anything that relies on a slow cooking process.” Traditionally, the curve of the pot was designed to control liquid in a way that made a lid unnecessary, but now, many pots even come with a lid that conveniently doubles as a tortilla warmer at the table. They may be most associated with classic New Mexico dishes, but they work just as well for cooking a Thai curry or Bolognese ragù. Unlike a lot of traditional Pueblo pottery, micaceous pots are not decorated with painted designs. Even the most elaborate pieces find their beauty solely in form, smoke marks, and the texture and appearance of the mica-abundant clay. These utilitarian pieces become imprinted with the marks of life in a home kitchen. Oil stains, fire scorch, and the small chips along a paper thin edge all become part of each pot’s story. Yolanda Rawlings micaceous pot. Photo by Stephanie Cameron. Ortiz describes his micaceous process the same way a farmer might describe a season in the field: “In the spring, I dig the clay. In the winter, I process it and build as much as I can when I can’t farm or forage. I fire in the spring when it’s warm and the pit is dry.” There is a strong kinship between micaceous pottery and the natural world. Rawlings also resonates with the agricultural-like spirit of the work. “I believe in all the ceremony around it because I have that connection to nature.” Her cycle of work echoes Ortiz’s: “We harvest clay in the warmer months, once the earth has thawed. We only take what we need, maybe one truck-bed load.” Then begins the laborious process of mixing, sifting, and kneading the clay. Each artist approaches these steps somewhat differently, but the end result is a pliable clay, free of impurities, tempered by some quantity of mica. 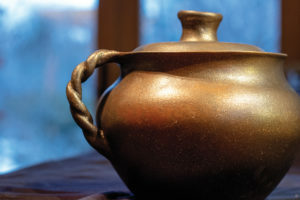 Micaceous pottery is always fired at a low temperature, so the clay remains porous and intermingles with its contents in a way that isn’t possible in most cookware. It’s like the clay itself becomes another ingredient in whatever dish you’re preparing. 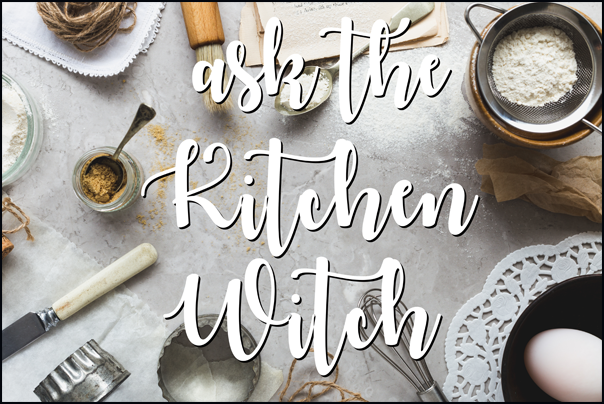 “When you’re using metal to cook, the transfer of heat is rapid and it’s shocking to your food, whereas when you’re cooking with micaceous clay, it’s more of a slow, even heat. It lasts longer and it retains more flavor,” says Rawlings.